It’s winter break, and you are dreading sending your child back to that school. Images flash through your mind of the first half of the school year, and something inside you knows you just can’t do it. You really want to withdraw your child from school. You need options, and for the first time in your life, you are actually considering homeschooling. You are not alone! This has become a yearly phenomenon all over Florida: parents, tired of feeling helpless while their child suffers in a school, often decide to take the plunge and withdraw their child from a school and homeschool mid-year. People from all walks of life, religions, and educational backgrounds homeschool their children, including single parents. If you have doubts, read this article which debunks a lot of homeschooling myths. There are lots of reasons why parents decide to pull a child out of a school. There are many reasons parents get to this point: perhaps your child is falling behind in school and the school isn’t doing enough to help, or you know you could do better at home. Maybe there is bullying that is going on unchecked and the school refuses to address it. Some parents are told in March that their child is going to fail kindergarten (!!) 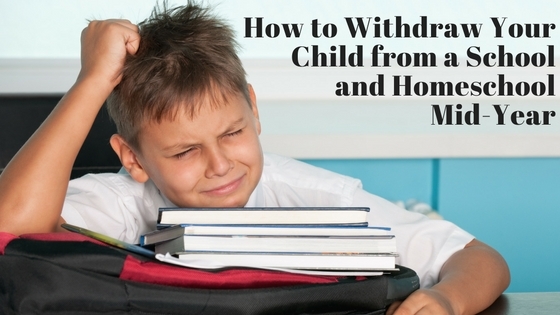 Or, perhaps your child is bored stiff and not learning anything … whatever the reason, this article is going to walk you through the basic steps you need to do in order to withdraw your child from a school and begin legally homeschooling in Florida. This is the most important thing that you need to do to avoid having to send your child back to the school. The letter of intent is a statement sent to the county superintendent, stating that your child will be home educated from this date forward. You give them your child’s name, date of birth, and address. That information, along with your signature, is all that is needed to begin legally homeschooling in Florida. If you keep your child home and you don’t send the county a letter of intent, then your child will be considered truant, and that is very serious. The county, upon receiving your letter, will usually send you a reply to say that “ok, you’re on your own!” and remind you of the other legal requirements you have as a homeschooling parent. You can read about all the legal requirements here. Our preferred method of notifying the county is via email. If you email your letter of intent to the county homeschool contact person, which is called the homeschool liaison (a list of county homeschool liaisons is here), then you have proof that you sent it, and it is instant. You also save yourself a trip to the school board or postage. Usually the county homeschool liaison replies to your email to confirm that they have received it. If a day or so has passed and you don’t get a reply from them, then definitely call to follow up and make sure it has been received. The best way to make sure that you don’t have any trouble or cause any confusion is to notify the school that you are withdrawing your child. You can email them a copy of your letter of intent to the county, and a copy of the county’s reply. Some parents like to cc the school vice-principal or guidance counselor in their letter of intent email, that way everyone gets notified at the same time. However, some schools insist that you withdraw your child in person. If you don’t mind going to the school, then in person is fine. However, you don’t have to go in person, you can simply call them and notify them. Do what is best and easiest for you, not them. Also, if they insist that you need to come down in person to withdraw your child, you don’t have to take your child with you if you don’t want to. Sometimes there has been drama, and taking the child to the school only prolongs it, or it can give the teachers or administrators an opportunity to tell your child negative things about homeschooling. It sounds crazy, but you would be appalled at the stories we have heard from parents about the way school personnel try to make children feel like something bad is going to happen to them now that they will be homeschooled. Not all school personnel are like this, of course, and there are some very encouraging ones as well. There is nothing wrong with taking your child with you if you have to withdraw them in person, but you know your situation and you need to do what is best for you and your child, not them. 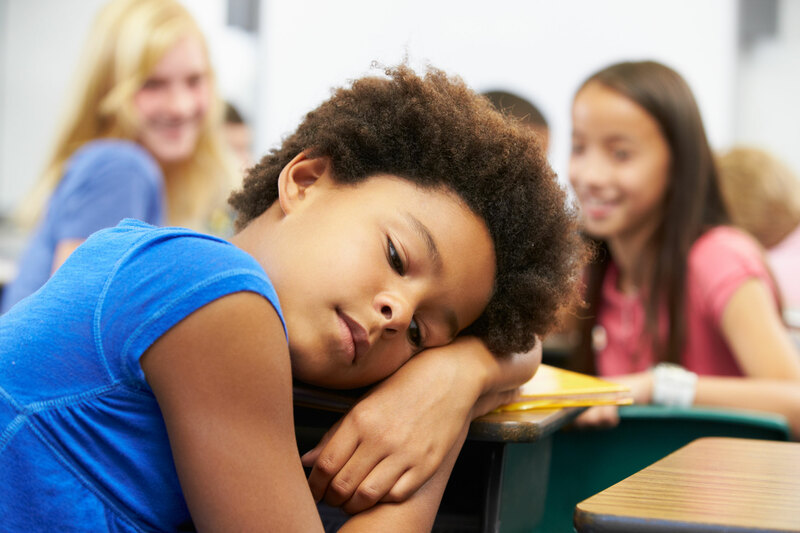 Note: If there has been drama with teachers or school administrators, then we want to encourage you to be very quiet and calm when speaking with them when you withdraw your child. Trust us on this. 3. I’m Homeschooling! Now What? Here is the bottom line: once you begin homeschooling your child, you become their teacher, facilitator, guidance counselor, and school principal. You, the parent, decide what they study, when they study, how they study, and for how long. You choose. There is a very good reason why the homeschool office at the Florida Dept. of Education is called “Office of Independent Education and Parental Choice.” It is because homeschooling is all about putting the parent in the driver’s seat. That is an incredible responsibility, but it is also an incredible opportunity. You are free to direct your child’s education in the ways that you see fit. In your new role you need to take a hard look at where your child stands academically. Depending on their situation, you might have to remediate certain subjects, or focus on one subject to bring them up to speed academically. If your child has been in a school, chances are there is some de-programming to be done. Some parents decide to de-school for a while to help put some space between a bad situation so they can start fresh. The first year homeschooling is a time of figuring out where your child is at, what their learning style is, and how to give them back their love of learning. Chances are there will be some trial and error to figure out what curriculum approach works best for them. This is normal. Once your child is free from the constraints and drama of the school, then you should take a hard look at where they are at academically. A simple way to do this is to buy some grade level workbooks and see how they progress for a few weeks. You might see areas where they need review, or they might be ready for higher level work. The best way to get through this initial time is to stay flexible, and know that whatever time you take to address your child’s deficiencies is time well spent. One thing is certain: they will not be getting this type of one-on-one attention in a school. Pulling a child out to homeschool in January to “finish out the year” at home, only to put them back into a school in August is not recommended. If this is your plan, then we do not recommend homeschooling. We recommend enrolling your child in Florida Virtual School Full Time. It is public school education, except your child can do it at home. They can then transfer back to a brick and mortar school in August easily. This is not homeschooling. FLVS FT only has open enrollment certain times a year. Currently for 2018 the grade 6-8 deadline is Dec. 13, 2017; Grades K-2 deadline: Jan. 19, 2018. Enrollment is not available for grades 3-5 and 9-12 until the summer. I really hate to say it but I never recommend FT – ever, ever EXCEPT in this particular situation of pulling a child out mid-year with the intent of putting them back come August. While it can be done using Flex, which is the far better option, it would have to be a seamless transition and sometimes there are extenuating circumstances that make it a difficult transition. As a result, sometimes the progress that needs to happen in order to promote the child to the next grade gets backed up, and that can complicate things come August. I only speak from experience, there are lots of parents in FL who come to this point during the winter break (hence the article). While they can totally pull them out and homeschool, we haven’t seen a high success rate with re-entry in August. Sometimes the child doesn’t end up doing very much work- that’s one big problem. That’s not a bad thing – if a child is coming from a toxic school environment, we recommend taking a step back and de-programming them for some time, so they can feel like themselves again. But, in this particular situation time is short – you have to keep the ball rolling to be ready to jump back in come August. So, one way to avoid that is to do FT. It’s public school at home – and if you just want to take a child out of a toxic situation, until you can resituate them in August, then it is good enough for that. 4. Finding Curriculum, Support, Etc. Once you withdraw your child to homeschool, the county does not provide you with any curriculum. That’s your responsibility, so if you are serious about homeschooling, then start looking for curriculum. There are LOTS of options out there, everything from free (Easy Peasy, FLVS FLEX, Khan Academy) to very expensive (A Beka, Calvert, Stanford University, etc). Another option is to enroll your child in a homeschool co-op or a hybrid school in your area. These usually meet once a week, and will have follow-up work that your child will do at home the rest of the week. Florida Homeschooling Parents Using FLVS Flex is run by me and we cover the nuts and bolts of using FLVS Flex successfully, AND everything you need to know to homeschool in FL. Florida Homeschoolers is a great group where you can ask questions and get lots of information from parents all around the state. Florida Parent Educators Association is a statewide group of homeschooling parents. 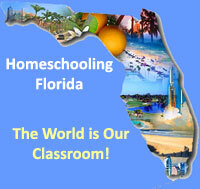 They have a contact person in every region of FL to help field your homeschooling questions. We highly recommend attending the annual FPEA Homeschool Convention, which is held each May at the Gaylord Palms Resort in Kissimmee, FL. It is three days full of informative and encouraging seminars on every aspect of homeschooling your child, plus a huge convention hall full of homeschool curriculum publishers. It’s a great place to browse and get ideas for curriculum, and the best part is that you can meet and talk to veteran homeschoolers and figure out what is best for your child. Apart from sending a letter of intent, there are a couple more things you are required to do in order to homeschool legally in Florida. The first thing is to keep a portfolio of your child’s work. Don’t let that word “portfolio” scare you. A portfolio is simply a collection of your child’s work over the past 12 months. You can keep it however you want to. The law doesn’t stipulate HOW to keep the portfolio, it just says “keep a portfolio.” You can keep it in a folder, box, crate, binder, or keep it digitally on your computer or in the cloud. Choose the method that is best for YOU. Every year, once a year, by the anniversary date of your letter of intent, your child has to have an evaluation. This must be done by a certified teacher. The evaluation is very simple, basically the teacher reviews your child’s work to determine whether or not they have made progress in the past 12 months, according to the child’s own ability. What this means is that the teacher isn’t going to compare your child to anyone else. They are going to look at your child’s work and simply look for progress. There are lots of homeschool-friendly certified teachers that are available as evaluators. One of the best is Charles Curtis Tucker (he goes by Curtis), he is a homeschooling father of 5 children, and he makes evaluations simple, easy, and economical ($28 for an online evaluation, $35 for an in-person evaluation). He is also my husband 🙂 You can reach him on his website: www.Homeschool-Evaluations.com, through his Facebook page, and by phone at 786-525-3545/904-403-6714 /321-431-1869. If you prefer, instead of an evaluation, you can have your child take a standardized test (IOWA, Stanford Achievement, CAT are all popular choices). However, in order for the test results to be accepted by the county the test MUST be administered by a certified teacher. Standardized testing is more expensive than an evaluation because you have to pay for the test materials, scoring, postage back and forth from the test publisher, and the teacher’s time to adminster it. Lots of co-ops offer group testing to help minimize costs for parents. Group testing usually costs around $50 per child, depending on the test. My husband also does testing both individually and in groups. Please feel free to ask us questions in the comments! We believe that you, the parent, are uniquely equipped to meet the educational needs of your children, because no one loves them or wants them to succeed more than you do. Our desire is to support and encourage your in your homeschooling journey. Absolutely wonderful article! I’ve been homeschooling my 17 y/o twins since elementary. We’ve recently relocated to the panhandle from VA & are delighted with transition from VA requirements to FL requirements for homeschooling! Can you recommend the best resources for extra curricular/social activities for homeschooled youth & families? Thank you in advance!